Lake Vyrnwy / Llyn Efyrnwy01691 870278work ReservoirLake Vyrnwy is such a beautiful location, the mountains embrace a lake containing some twelve billion gallons of water resulting in scenery reminiscent of the Alps. The lake which is 5 miles long and half a mile wide looks incredibly natural and you can hardly believe that it was created by in the late 19th century by Liverpool Corporation, to provide a storage reservoir of safe water for the rapidly growing city of Liverpool. At that time, many cities in Britain were becoming crowded with workers for the new factories and mills of the Industrial Revolution. Terrible slums grew around these factories, and clean water was desperately needed to reduce the dangers of disease. The factories too needed large quantities of water for their steam-driven machines and the deep valleys of Wales were the obvious solution. The amazing thing is, this has been done so well, that it is such a fantastic stretch of water teeming with wildlife. The huge dam across the river valley was completed in 1889, and was the first large stone-built dam in Britain. Earlier dams had just been created by making earth embankments. As you take a relatively easy 12 mile bike ride around the lake there is so much to see. Firstly the lake lies in an incredibly secluded spot west of the village of Llanfyllin. It is surrounded by remote mountains and thick forests and its dramatic personality is enhanced by inky black waters and a fairytale neo-Gothic water tower. The new lake meant that the farms and houses of the people of the valley would be lost underwater. In order to create the large lake the valley of the River Vyrnwy had to be closed off by the huge stone dam and the whole valley behind the dam which contained the old village of Llanwddyn was flooded. Work on the dam building project began in 1881, and for the next eight years the dam wall at the bottom of the valley was steadily getting higher while the people living in the village went about their everyday lives. the flooding, for the people who lost their homes. The buildings of the old village were knocked down after the people moved out, and even the remains of the dead were removed from the churchyard and reburied next to the new church. In particularly dry summers, the level of the water falls, and you can see the remains of the village. The dam itself is pretty impressive, 26m high from the bed of the lake to the sill for the overflow, but almost twice that if measured from the buried foundations to the top of the final structure. The dam is 357m long and the base is 36.5m thick. The stepped openings at the bottom of the contain tunnels which can be controlled to allow enough water to carry on down the river so that it continues to flow normally. The machinery for operating the valves is located inside the two stone towers on the top of the dam wall above the two tunnels. There is a very unusual pointed tower which rises out of the waters of Lake Vyrnwy some distance from the dam. It looks like part of a fairytale castle, and it is linked to the shore by an arched bridge. This is the 'straining tower', which is where the water leaves the lake at the start of a journey along an aqueduct and pipeline to Liverpool, around 70 miles away. It is called a straining tower because the water first passes through a fine metal mesh to filter or strain out material in the water. 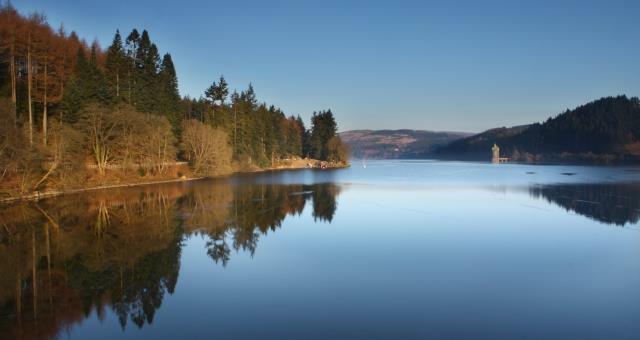 Lake Vyrnwy is such a beautiful location, the mountains embrace a lake containing some twelve billion gallons of water resulting in scenery reminiscent of the Alps. The lake which is 5 miles long and half a mile wide looks incredibly natural and you can hardly believe that it was created by in the late 19th century by Liverpool Corporation, to provide a storage reservoir of safe water for the rapidly growing city of Liverpool. The tower stands in over 15m deep water and is over 48m high, so much of the structure is hidden underwater.